The Federal Government through the Rural Electrification Agency (REA) is implementing the Energizing Economies Initiative (EEI) which supports the rapid deployment of off-grid electricity solutions to provide clean, safe, affordable and reliable electricity to economic clusters (e.g., market places, shopping centres, industrial facilities) in Nigeria through private sector developers. EEI aims to assist over 80,000 shops within a year, empower over 340,000 micro, small and medium enterprises, create over 2,500 jobs with the initial 16 economic clusters while serving over 18 million Nigerians. 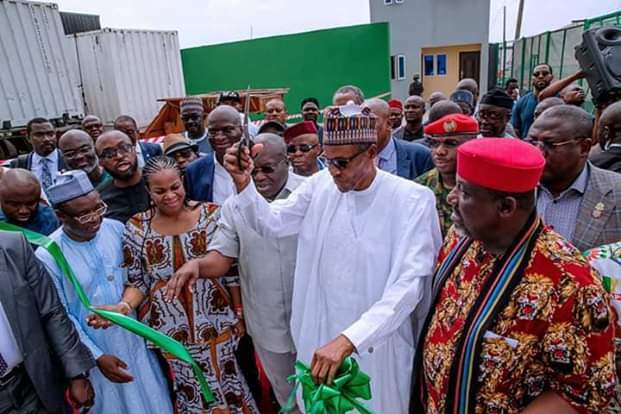 On Tuesday, 29th January, 2019, President Muhammadu Buhari, gave more boost to it with the commissioning of the Ariaria Market Independent Power Project (IPP) in company of Okezie Ikpeazu, Governor of Abia State; Rochas Okorocha, Governor of Imo State; APC National Chairman, Comrade Adams Oshiomhole; Former Senate President, Sen. Ken Nnamani; Ministers of Power, Works & Housing, Foreign Affairs, Labour & Productivity, Science & Technology; the Managing Director/CEO, Rural Electrification Agency, Mrs. Damilola Ogunbiyi; the Managing Director & Chairman of Ariaria Market Energy Solutions Limited (AMES) and other dignitaries. has The project has created 250 direct jobs and 370 indirect jobs so far.